I went to my first Mani Party last weekend with a few fellow nail fans and it was fantastic! Desiree Mattox, chemist and expert in cosmetic science (envielabs.com), supplied us with a wonderful hand soak, scrub, and moisturizer. She even does custom cosmetics for your specific skin type and custom fragrances using all natural ingredients! Check out the link above! After the hand and nail pampering, the polishing began! Check out all the fun designs below! Great googly moogly! I don’t know why these sites give so little warning, but TODAY ONLY UNTIL 11:59pm, Zoya is giving away one of their summer nail colors FOR FREE, all you have to pay for is shipping and handling! You can choose one from their Summertime, Sunshine, or ModMatte collections. 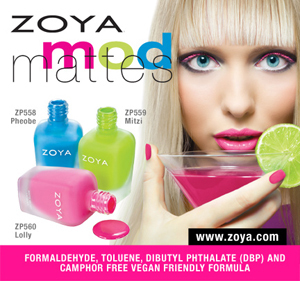 Quick background about Zoya – While many popular nail polish brands boast that they are “3-Free” (which means their formula is Dibutyl Phthalate (DBP), Formaldehyde and Toluene), Zoya is actually “4-free” as none of their formulas contain the above 3 nor do they contain camphor. Zoya is also a vegan company! Zoya is quickly gaining popularity and now is a great time to try it for yourself. Click here and you’ll be taken to the Zoya blog page that explains how you can claim your free bottle of polish. But do it today! If you’re interested in what chemicals actually make up nail polish, check out this article from the Nails Magazine site explaining how nail polish *works* and the whole deal about terms like “3-Free”. More so than any other question about my nails, I’m asked what makes a long lasting manicure. If you’re willing to pay extra money at select nail salons, you may want to opt for Soak-Off Gel Polish (the pros and cons are described in detail here on All Lacquered Up). There are several companies that make it but most are familiar with the OPI brand, who makes a line called Axxium Soak-Off Gel Polish. Another option that is growing in popularity is CND (Creative Nail Design) Shellac, which is a hybrid of soak-off gel polish and regular polish (as described here on All Lacquered Up). As both of these methods require the use of UV light to dry the nails and the application techniques require skilled hands, these options are best left to the professionals AND they are much more costly than a traditional manicure. But the advantage is you’ll have a long-lasting, chip-free manicure for 2 (maybe even 3) weeks. 1. A good base coat. Much like a house needs a strong foundation, you need a good sticky base coat to create the bond between your nail and the nail polish color of your choice. I’ve been using CND Stickey (yep, it’s spelled Stickey) lately just to test it out and it seems to be doing well. But Orly Bonder is my tried and true, go-to base coat and I feel it is the best if you’re looking for longevity from your manicure. 1 other method/product recommendation you can try: If you’re looking for a long-lasting manicure that won’t get dull over time, use CND Super Shiney Top Coat (yep, Shiney). It is fantastic for that “just left the nail salon” shine but you must apply it every 2 days! I learned this the hard way. I wouldn’t suggest applying Seche Vite every 2 days because the formula is pretty thick and you don’t want layers upon layers of top coat on your manicure when it comes time to remove it. But CND Super Shiney is purposefully thin and applying Super Shiney every 2 days won’t give you a Super Thickey manicure over time. SO I’ve only gotten one lonely suggestion for my 1st Nail Art Challenge/Contest post. :`-(! BUT I’m feeling generous because my birthday is this week SO I used the Sally Beauty Club coupon I earned for the month of April to snag an extra bottle of Orly Bonder this past weekend. If you make a suggestion for my contest, you just might win both Orly Bonder (my go-to foundation) and Essie Quick-e (my “I’M IN A RUSH” final step)…THESE ARE THE ALPHA AND OMEGA OF A MANICURE…according to me. 😀 That’s the prize pack as it stands right now so click the link above and enter my contest dag nab it! I’m bribing you! Sheesh! P.S. I’ve been regularly reading the All Lacquered Up blog for about a year now and the lady who runs it has taught me most of what I know. Definitely bookmark it in addition to my blog of course!